Settled on an island beach with you and me. A mother knows when baby birds are grown. Far across the sea of shadows lies a promised land. The way is hard, but you can make it if you try. Give us a kiss and say goodbye. Someday you'll know the reason why. Build a cozy nest and learn to understand. Rises through the mist into eternity. What lives, grows, and what grows must create. We all have an inner need to be creative, to express ourselves, and yet some deny this need or their ability to fulfill it. 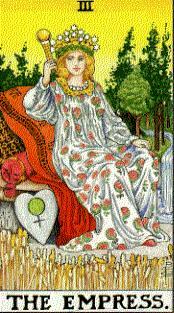 The lesson of The Empress is that creativity is a natural expression of the life force, accessible to everyone.